AVR USB Programmer is a low cost STK500V2 compatible In-System Programmer (ISP). It is supported in all operating systems including Windows 2000, XP, Vista, Windows 7, windows 8 & windows 10. Compatible to Atmel's STK500V2 with implemented USB to Serial converter. Compatible with AVR Studio, AVRDUDE and compilers having support for STK500 or STK500V2 protocol. Adjustable ISP clock allows flashing of devices clocked at very low rate, e.g. 32 kHz. High Speed Programming : Programs 32 KB flash in just 15 seconds. Uses USB power supply, no external supply required. AVR STUDIO (STK 500) software is used with AVR USB Programmer hardware to provide all the of the necessary functions like read, write, lock, and fuse settings. Any other software/compiler which supports STK500 protocol for programming. 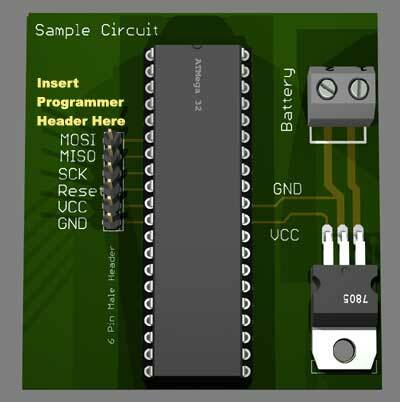 The AVR Board containing MCU can have standard 6 Pin ISP Male Header as shown below to connect to this Programmer. Doesn't seem to be working with Windows 10, even though Windows 10 is similar to Windows 8.